In the 26th century, humanity has left an overpopulated Earth to colonize a new solar system. The central planets formed the Alliance and won a war against the outer planet Independents—those who resisted joining the Alliance. River Tam (Summer Glau) is conditioned by Alliance scientists into becoming a psychic and an assassin. She is rescued by her brother Simon (Sean Maher). During her training, River inadvertently read the minds of several top government officials and learned their secrets. Consequently, a top Alliance agent known only as the Operative (Chiwetel Ejiofor) is tasked with recapturing her. The siblings have found refuge aboard the transport spaceship Serenity with Captain Malcolm "Mal" Reynolds (Nathan Fillion), first mate Zoe Washburne (Gina Torres), pilot Hoban "Wash" Washburne (Alan Tudyk), mercenary Jayne Cobb (Adam Baldwin), and mechanic Kaylee Frye (Jewel Staite). Despite Simon's objections, Mal brings River on a bank robbery. River warns them that savage and cannibalistic Reavers are coming. They escape, but Simon decides he and River will leave Serenity at the next port. Once there, however, a subliminal message in a television commercial causes River to attack numerous bar patrons, and Mal takes the siblings back aboard the ship. The crew contacts reclusive hacker Mr. Universe (David Krumholtz), who discovers the message designed to trigger River's mental conditioning. He notes River whispered "Miranda" before attacking and warns that someone else saw the footage. Mal receives an invitation to visit from Inara Serra (Morena Baccarin), a former Serenity occupant. Despite knowing it is a trap (Inara did not argue with him), Mal goes to rescue her. The Operative confronts Mal, promising to let him go free if he turns River over. Mal refuses and, with Inara's help, barely escapes. River reveals that Miranda is a planet located beyond a region of space swarming with Reavers. The crew flies to the planet Haven to ponder their next move, but they find Haven devastated and their old friend, Shepherd Book (Ron Glass), mortally wounded. The Operative claims responsibility, promising to keep pursuing them and killing anyone who assists them until he gets River. Despite the crew's objection, Mal disguises Serenity as a Reaver ship and travels to Miranda through a Reaver fleet without being attacked. On the planet, the crew find all its colonists dead and a recording by the last surviving member of an Alliance survey team (Sarah Paulson). She explains that an experimental chemical designed to suppress aggression was added into Miranda's atmosphere; the population became so docile they stopped performing all activities of daily living and placidly died. A small portion, however, had the opposite reaction and became extremely aggressive and violent beyond madness. In effect, the Alliance created the Reavers and this is the secret River Tam had discovered. Mr. Universe agrees to broadcast the recording, luring the crew to the Operative. However, the Operative kills him, orders the destruction of his transmitting equipment, and prepares an ambush. Knowing this, the crew deliberately provoke the Reaver fleet into chasing them and lead them to the Alliance armada in orbit of Mr. Universe's planet. The Reavers and Alliance ships battle while Wash manages to pilot Serenity through the crossfire to the planet; despite taking serious damage, he crash lands near the broadcast tower before being killed by a Reaver spear. The Operative's ship is destroyed but he manages to get to an escape pod and also heads to the broadcast tower. The rest of the crew make a last stand against the Reavers to buy Mal time to broadcast the recording. Through a message recorded by Mr. Universe before his death, Mal learns of a backup transmitter, but the Operative comes across this message as well. Sustaining heavy injuries, the crew retreats behind a set of blast doors that fail to properly close. A Reaver shoots through the opening, severely wounding Simon. River dives through the doors to close them before the Reavers drag her away. At the backup transmitter, Mal fights the Operative, finally subduing him and forcing him to watch the broadcast recording. Mal returns to the crew, and the blast doors open to reveal that River has killed all the Reavers. Alliance troops arrive, but the Operative orders them to stand down. The Operative provides medical aid and resources to repair Serenity. He tells Mal the broadcast has weakened the Alliance government, but while he will try to convince the Parliament that River and Simon are no longer threats, he warns that they will likely continue their pursuit in retribution for getting the word out. Serenity takes off with River as Mal's new pilot. The nine returning Firefly cast members. Left: from left to right, top to bottom: Ron Glass, Summer Glau, Alan Tudyk, Sean Maher, Adam Baldwin, Jewel Staite, Morena Baccarin and Nathan Fillion in 2005. Right: Gina Torres in 2008. In July 2003, Whedon said that though there was interest in the project, "I won't know really until I finish a draft whether or not it's genuine." He felt that any film deal was contingent on keeping the show's original cast, though he later stated that retaining the cast was "never an issue" as Universal executives believed the cast suitable after watching every episode of the series. In early September 2004, a film deal with Universal was publicly confirmed. Universal acquired the rights to Firefly shortly before the confirmation. Whedon felt that the strong sales of the Firefly DVD, which sold out in less than twenty-four hours after the pre-order announcement, "definitely helped light a fire and make them [Universal] go, 'Okay, we've really got something here.' It definitely helped them just be comfortable with the decisions they were making, but they really had been supporting us for quite some time already." Whedon felt it was "important people understand that the movie isn't the series", and so the project was titled Serenity. After Universal acquired the film rights from Fox, Whedon began writing the screenplay. His task was to explain the premise of a television series that few had seen without boring new viewers or longtime fans. He based his story on original story ideas for Firefly's un-filmed second season. Whedon's original script was 190 pages, and attempted to address all major plot points introduced in the series. After presenting the script to Barry Mendel under the title "The Kitchen Sink", Whedon and Mendel collaborated on cutting down the script to a size film-able under his budget constraints. All nine principal cast members from the television series were scheduled to return for the movie, but Glass and Tudyk could not commit to sequels, leading to the death of their characters in the second draft of the script. The tightened script and a budget Mendel and Whedon prepared were submitted to Universal on a Friday and on the following Monday morning, Stacey Snider, then head of Universal, called Mendel to officially greenlight the movie. Universal planned to begin shooting in October 2003, but delays in finishing the script postponed the start of shooting to June 2004. Diamond Ranch High School served as the location of the planet Miranda. Principal photography for Serenity was originally estimated to require eighty days, lasting a typical twelve to fourteen hours each, with a budget of over $100 million. Unwilling to approve of such a large budget, Universal Studios wished to shoot abroad to minimize production costs. However, Whedon, reluctant to uproot his family, insisted that filming take place locally and maintained that it was possible for a local production to cost fewer days and less than half the expected budget. On March 2, 2004, the film was greenlit for production with a budget of under $40 million. At the project's completion, the film spent $39 million, considered low for a science fiction action film featuring heavy special effects. Serenity was filmed over a period of fifty ten-hour days, beginning June 3, 2004 and ending September 17, 2004. The film was primarily shot on Universal Studio sound stages with locations throughout Los Angeles. The sequence where the crew is pursued by Reavers after a bank robbery was filmed along the Templin Highway north of Santa Clarita. The shoot typically would have lasted thirty days, but the production completed filming the sequence in five days. Pyrotechnics were shot at Mystery Mesa, near Valencia, California, over a period of three days rather than a typical two weeks. 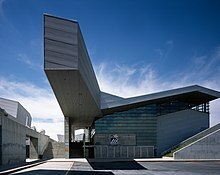 The scenes on the planet Miranda were filmed at Diamond Ranch High School in Pomona. The production expected to save money by reusing the Serenity ship interior set from the Firefly television series. However, the set had been built in pieces as episodes called for new rooms on the ship. Using DVD images of the television series as a guide, the set was rebuilt over fourteen weeks on Universal Studios' Stage 12 by twenty-three supervised crews working independently but in coordination with one another. As the budget for the film was considerably smaller than for the TV series, practical special effects were used as much as possible: if a computer-generated imagery (CGI) composite was required, as many tangible sets and props as possible were constructed to minimize the use of computer effects. The most technically challenging scene was the mule skiff chase. For budgetary reasons, a gimbal and CGI, much like those used in the pod race in Star Wars: Episode I – The Phantom Menace, were quickly ruled out. Instead, the crew fashioned a trailer with a cantilevered arm attached to the "hovercraft" and shot the scene while riding up Templin Highway north of Santa Clarita. Zoic Studios, the company that produced the graphics for the series, had to perform a complete overhaul of their computer model of Serenity, as the television model would not stand up to the high-definition scrutiny of cinema screens (and high-definition video resolution). In pre-production memos, Whedon described his vision for the score as "spare, intimate, mournful and indefatigable". Just as the landscape and speech drew from elements of the Western, he wished the same of the musical style and instrumentation. However, he did not want to step too far into Western clichés to "cause justified derision" and hoped the score would also draw from Chinese and other Asian musical elements. He wanted the musical elements "mixed up, hidden, or it's as much a cliché as the western feel. We don't want to be too specific about culture or time. We want to be comfortable enough with the sounds not to let them take us out of the story, but not so comfortable that we begin to be told where the story is." Music was to draw heavily on what could be carried, and he highlighted four instruments: voice, percussion, woodwind, strings particularly guitar. He cautioned against vocal orchestration, believing there to be only two voices in Hollywood and wishing to avoid both, and advised moderation in woodwind, feeling wind instruments to be "either too airy or too sophisticated". Universal Studios wanted a composer with experience scoring films, ruling out Firefly's composer Greg Edmonson. Whedon first thought of Carter Burwell, of whom Whedon was a huge fan. However, Whedon later felt that Burwell was not the right choice because as the film changed, the needs of the score changed as well. Burwell found working on the project difficult as it required he work "opposite" to his usual approach. The production would have continued with Burwell, but his other obligations left him little time to compose an entirely new score for Serenity. Burwell was dropped from the project a few weeks before the scheduled February 2005 recording. David Newman was recommended by Universal's music executives when Whedon requested a composer capable of "everything" and "quickly". Whedon's instructions to Newman for the ship Serenity's theme was something homemade and mournful, evoking the idea of pioneers who had only what they could carry. Whedon wished the theme to let viewers know they were now home. River Tam's theme was played on a uniquely shaped, square, antique piano that was slightly out of tune. The piano reminded Newman of River and composed a "haunting, haunted, vaguely eastern and achingly unresolved" theme that Whedon felt proved Newman's understanding of the film's musical needs. The score was performed by the Hollywood Studio Symphony under Newman's direction. The official soundtrack was released September 27, 2005. Serenity had its world premiere at the Edinburgh International Film Festival on August 22, 2005. The premiere sold out, and the festival arranged for two more screenings on August 24, which sold out in twenty-four hours, and in the "Best of the Fest" line-up on August 28. The film was theatrically released September 30, 2005. Serenity was originally released on traditional film prints. Because the original 2K digital intermediate scans were readily available, the film was chosen by Universal Pictures to test conversion to a Digital Cinema Distribution Master of the film and to "test the workflow required to create a [Digital Cinema Package]." Serenity became the first film to fully conform to Digital Cinema Initiatives specifications, marking "a major milestone in the move toward all-digital projection". In April 2005, Universal launched a three-stage grassroots marketing campaign. A rough cut of the film was previewed in a total of thirty-five North American cities where the Firefly television series received the highest Nielsen ratings. The screenings did not bear the name of the film and relied on word-of-mouth within the fanbase for promotion. All screenings sold out in less than twenty-four hours, sometimes in as quickly as five minutes. The first screening was held May 5, 2005 in ten cities. The second screening on May 26 increased the number of cities to twenty. In the twenty-four hours following the announcement of the second screening, the Firefly fanbase launched trial and error efforts to uncover the theaters holding the screenings, leading the event to be sold out before the official listing was released. The third screening on June 23 was held in thirty-five cities. A final screening was held at Comic-Con International, followed by a panel with Whedon and the cast. Session 416, also known as the R. Tam Sessions, are a series of five short videos anonymously released by Whedon through various websites and message boards as a form of viral marketing. The first video, bearing the title card "R. Tam, Session 416, Second Excerpt", was released on the iFilm website on August 16, 2005. By September 7, 2005, all five videos had been released. Though a representative from Universal Studios stated to have no knowledge of the videos' origin, the idea to launch an online viral marketing campaign came first from Universal executives. After they approached Whedon with the idea, he decided to use the format to explore events before either the film or the television series. The clips were filmed with a "tiny" crew in a single day shoot and are shot in grainy, low quality, black-and-white. They were later included on the Collector's Edition DVD. The videos, sequenced out of chronological order, depict excerpts of counseling sessions between River Tam, played by Summer Glau, and her unnamed therapist, played by Whedon, while she is held at the Alliance Academy. They follow her change from shy and sweet child prodigy to the mentally unstable girl of the television series. Serenity was released on Region 1 DVD, VHS and UMD on December 20, 2005. The DVD ranked #3 in sales for the week ending December 25, 2005. Bonus features available on the DVD version audio commentary from Whedon, deleted scenes and outtakes, a short introduction by Whedon originally preluding the film at advance screenings, an easter egg on the creation of the Fruity Oaty Bar commercial, and three featurettes on the Firefly and Serenity universe, special effects, and the revival of the television series to film. Region 2 releases included an additional making-of featurette, and Region 4 releases included additional extended scenes, a tour of the set, a feature on cinematographer Jack Green, and a question and answer session with Whedon filmed after an advance screening in Australia. Serenity was released on HD DVD on April 18, 2006 and was the first Universal Studios film to be released on the format. In January 2007, it also became the first full resolution rip of an HD DVD release uploaded to the BitTorrent network after its title key was ripped from a software player and released online. A 2-disc Collector's Edition DVD was released for Region 1 on August 21, 2007. In addition to the special features featured on the Region 4, with exception of the question and answer session, the release included Session 416, a documentary on the film, and a second commentary with Whedon and actors Nathan Fillion, Adam Baldwin, Summer Glau, and Ron Glass. The film was released on Blu-ray on December 30, 2008, adding to the special features a video version of the cast commentary, picture-in-picture visual commentary, two databases of in-universe material, and a digital tour of Serenity. Serenity was released on 4K UHD Blu-Ray on May 22 2018. Despite high anticipation, Serenity performed poorly at the box office. Although several pundits predicted a #1 opening, the film opened at #2 in the United States, taking in $10.1 million on its first weekend, spending two weeks in the top ten, and closed on November 17, 2005 with a domestic box office gross of $25.5 million. Movie industry analyst Brandon Gray described Serenity's box office performance as "like a below average genre picture". Serenity's international box office results were mixed, with strong openings in the UK, Portugal and Russia, but poor results in Spain, Australia, France and Italy. United International Pictures canceled the film's theatrical release in at least seven countries, planning to release it directly to DVD instead. The box office income outside the United States was $13.3 million, with a worldwide total of $38.9 million. Serenity received mostly positive reviews from film critics. On review aggregator site Rotten Tomatoes, the film has an 83% approval rating based on 185 reviews, with an average rating of 7.2/10. The site's critical consensus states: "Snappy dialogue and goofy characters make this Wild Wild West soap opera in space fun and adventurous." Metacritic gives the film a weighted average score of 74 based on reviews from 34 critics, indicating "generally favorable reviews". Ebert and Roeper gave the film a "Two Thumbs Up" rating. Roger Ebert, in his review for the Chicago Sun-Times, gave the film three out of four stars, commenting that it is "made of dubious but energetic special effects, breathless velocity, much imagination, some sly verbal wit and a little political satire". "The movie plays like a critique of contemporary society", he observed, also stating that in this way it was like Brave New World and Nineteen Eighty-Four. Peter Hartlaub in the San Francisco Chronicle called it "a triumph", comparing its writing to the best Star Trek episodes, while Manohla Dargis of The New York Times described it as a modest but superior science fiction film. Science fiction author Orson Scott Card called Serenity "the best science fiction film ever", further stating "If Ender's Game can't be this kind of movie, and this good a movie, then I want it never to be made. I'd rather just watch Serenity again." USA Today film critic Claudia Puig wrote that "the characters are generally uninteresting and one-dimensional, and the futuristic Western-style plot grows tedious" while Variety declared that the film "bounces around to sometimes memorable effect but rarely soars". Serenity won several awards after its release. It won the Hugo Award for Best Dramatic Presentation—Long Form, the Nebula Award for Best Script, and the Prometheus Special Award. The film was also named film of the year by Film 2005 and FilmFocus, and it was determined by SFX magazine to be the best science fiction movie of all time in 2007. IGN Film awarded Serenity Best Sci-Fi, Best Story, and Best Trailer for the year, and it won second for Overall Best Movie after Batman Begins. The SyFy Genre Awards awarded it runner-up in the categories for Best Movie, Best Actor in a film (Nathan Fillion), and Best Actress in a film (Summer Glau), losing in all categories to Harry Potter and the Goblet of Fire. Serenity later ranked 383 on Empire magazine's 500 Greatest Films of All Time and 90 of the 301 Greatest Movies of All Time as voted by the magazine's readers. NASA astronaut Steven Swanson, a huge fan of the series, took the Region 1 Firefly and Serenity DVDs with him on Space Shuttle Atlantis' STS-117 mission, which lifted off on Friday June 8, 2007. The DVDs will permanently reside on the International Space Station as a form of entertainment for the station's crews. On February 20, 2009, NASA announced an online poll to name Node 3 of the International Space Station; NASA-suggested options included Earthrise, Legacy, Serenity and Venture. At the March 20, 2009 poll close, 'Serenity' led those four choices with 70% of the vote, though the winner of the poll was 'Colbert', a reference to late night comedy show host Stephen Colbert. In the end, the poll was discarded and the node was eventually named 'Tranquility'. This has become a multi-venue event held each calendar year in various countries and cities and on various dates throughout the year. Funds raised by the events go to Equality Now (and other charities). Universal Studios wished to do an animated prequel to the Serenity film. Whedon and Brett Matthews wrote a story for the feature, but Universal ultimately decided against the project. The story was rewritten into a three-issue comic book miniseries intended to bridge the gap between the television series and the film. Serenity: Those Left Behind was released from July through September 2005 by Dark Horse Comics. A novelization of the film was written by Keith DeCandido and published by Simon & Schuster under their Pocket Star imprint on August 30, 2005. Titan Publishing published Serenity: The Official Visual Companion on September 1, 2005, and Titan Magazines released a one-shot souvenir magazine. Margaret Weis Productions released the Serenity tabletop role-playing game based on the film on September 19, 2005. Inkworks issued a 72-card trading card set, including autographed cards and cards with swatches of costumes used in the film, on September 21, 2005. The set won Diamond Comics' 2005 Non-Sports Card Product of the Year Gem Award. Diamond Select Toys released five six-inch action figures initially featuring Malcolm Reynolds, Jayne Cobb, and a Reaver, later adding River Tam, Inara Serra, and Zoe Washburne. The line was deemed to be "disappointing" with the figure of Malcolm Reynolds particularly singled out; both won MCWToys' silver award for Worst Line and Worst Male Figure under twelve inches for 2005. While the film depicts the Alliance as an all-powerful, authoritarian-style regime, Whedon is careful to point out that it is not so simple as that. "The Alliance isn't some evil empire", he explains, but rather a largely benevolent bureaucratic force. The Alliance's main problem is that it seeks to govern everyone, regardless of whether they desire to belong to the central government or not. What the crew of Serenity represent—specifically Mal and his lifestyle—is the idea that people should have the right to make their own decisions, even if those decisions are bad. The Operative embodies the Alliance and is, as Whedon describes, the "perfect product of what's wrong with the Alliance". He is someone whose motives are to achieve a good end, a "world without sin". The Operative believes so strongly in this idea that he willingly compromises his humanity in furtherance of it—as he himself admits, he would have no place in this world. In contrast, Mal is, at the movie's beginning, a man who has lost all faith. By the movie's ending, Mal has finally come to believe so strongly in something—individual liberty—that he becomes willing to lay down his life to preserve it. Whedon has said that the most important line spoken in the film is when Mal forces the Operative to watch the Miranda footage at the climax of the film, promising him: "I'm going to show you a world without sin". Whedon makes the point that a world without sin is a world without choice, and that choice is ultimately what defines humanity. According to Whedon, the planet "Miranda" was named for William Shakespeare's Miranda in The Tempest, who in Act V, scene I says: "O brave new world, / That has such people in't!" A spaceship found on the planet Miranda carries the codename "C57D", a reference to the flying saucer in the 1956 film Forbidden Planet. The plot to Forbidden Planet is based on The Tempest and, like Serenity, features a character struggling with his subconscious. The Alliance had hoped that Miranda would be a new kind of world, filled with peaceful, happy people, and represents the "inane optimism of the Alliance". The Fruity Oaty Bar commercial shown in the Maidenhead spaceport bar, which carried the subliminal message that triggered River Tam, is partially inspired by Mr. Sparkle, the mascot of a fictional brand of dish-washing detergent, who was featured in The Simpsons episode "In Marge We Trust". Whedon mentions in a DVD feature that when the Fruity Oaty Bar commercial was being designed, he constantly asked the animators to redesign it and make it even more bizarre than the previous design, until it arrived at the version presented on screen. Fans had hoped that if Serenity had been successful, it might lead to either a sequel or a film trilogy. The first major sequel rumor began on December 1, 2005, when IGN Filmforce reported that Universal had expressed an interest in making a Serenity television movie for broadcast on the Sci-Fi Channel. It was expected that commissioning of a television sequel would be contingent on strong DVD sales of Serenity. In a January 2006 interview, Whedon doubted the chances of a sequel. On October 1, 2006, Whedon posted a comment to the Whedonesque.com website, debunking a rumor that he was working on a sequel. In an interview at the 2007 Comic-Con, Whedon stated that he believes hope for a sequel rests in the sales of the Collector's Edition DVD. In an August 2007 interview with Amazon.com prior to the Collector's Edition DVD release, Whedon stated, "It's still on my mind, I mean, but I don't know if mine is the only mind that it's on." He later said, "You know, whether or not anybody who's involved would be available at that point—everybody's working, I'm happy to say—is a question, but whether I would want to do another one is not a question." ^ "Serenity (15)". British Board of Film Classification. August 15, 2005. Retrieved June 1, 2013. ^ a b c d e f "Serenity (2005) – Daily Box Office". Box Office Mojo. Retrieved August 27, 2006. ^ "Serenity (2005)". The Numbers. Retrieved October 13, 2015. ^ a b c d e Whedon, Joss (2005). Serenity: The Official Visual Companion. Titan Books. p. 17. ISBN 978-1-84576-082-3. ^ "Networks Nix Firefly". Sci-Fi Channel. January 15, 2003. Archived from the original on January 16, 2003. Retrieved April 5, 2015. ^ Bianculli, David (May 16, 2003). "Fox anchored in reality, plus seven new scripts". New York Daily News. Archived from the original on August 3, 2003. Retrieved April 5, 2015. ^ "Whedon Flies into Firefly Movie". IGN. September 4, 2003. Archived from the original on December 4, 2003. Retrieved April 5, 2015. ^ a b "Whedon Writes Firefly Film". Sci-Fi Channel. July 15, 2003. Archived from the original on July 29, 2003. Retrieved April 5, 2015. ^ Whedon, Joss (2005). Serenity: The Official Visual Companion. Titan Books. p. 18. ISBN 978-1-84576-082-3. ^ a b Kit, Zorianna; Gardner, Chris (September 4, 2003). "'Firefly' lands in film afterlife". The Hollywood Reporter. Archived from the original on October 2, 2003. Retrieved April 5, 2015. ^ a b Snyder, Gabriel (March 2, 2004). "Whedon's 'Serenity' greenlit". Variety. Retrieved May 12, 2015. ^ "Joss Whedon Experience Panel Comic-Con 2010 Part 3". July 23, 2010 – via YouTube. ^ a b c d e f g McNamara, Mary (October 9, 2005). "Down-home directing". Los Angeles Times. Archived from the original on May 15, 2006. Retrieved May 12, 2005. ^ a b c Snyder, Gabriel (March 21, 2004). "'Firefly' feature alights". Variety. Retrieved May 12, 2015. ^ Fuson, Brian (October 3, 2005). "'Flightplan' stays aloft: fends off newcomers for No. 1; 'Serenity' second". The Hollywood Reporter. ^ Pascale, Amy (August 1, 2014). Joss Whedon: The Biography. Chicago Review Press. p. 244. ISBN 978-1613741047. ^ "Greetings from Joss — Serenity". Serenity movie. September 17, 2004. Archived from the original on October 12, 2004. Retrieved March 27, 2015. ^ Brown, Robert (Spring 2011). "You Can't Go Home Again: The Place of Tradition in Firefly's Dystopian Utopia and Utopian Dystopia". Traditional Dwellings and Settlements Review. JSTOR 23566274. ^ a b Whedon, Serenity: Director's Commentary, "What's In A Firefly"
^ Miller, Gerri. "Inside 'Serenity'". Retrieved July 9, 2006. ^ "Interview with Zoic Studios' Visual Effects for Serenity". NewTek.com. January 24, 2006. Archived from the original on March 18, 2006. Retrieved July 9, 2006. ^ Whedon, Joss (2005). Serenity: The Official Visual Companion. Titan Books. pp. 30–31. ISBN 978-1845760823. ^ a b Whedon, Joss (January 23, 2005). "Carter Burwell is no longer working on Serenity". Whedonesque.com. Retrieved April 11, 2015. ^ a b Burwell, Carter. "The Body — Projects — Serenity". Archived from the original on December 6, 2006. Retrieved April 11, 2015. ^ a b Whedon, Joss (2005). "A Note from the Director". Serenity (Liner notes). David Newman. Varèse Sarabande. ^ a b "Serenity Cast Attend EIFF Red Carpet". Edinburgh International Film Festival. August 11, 2005. Retrieved April 18, 2015. ^ "Serenity". Edinburgh International Film Festival. Archived from the original on August 4, 2005. Retrieved April 18, 2015. ^ a b "Great News for all Serenity Fans". Edinburgh International Film Festival. July 15, 2005. Retrieved April 18, 2015. ^ "Serenity Sold Out". Edinburgh International Film Festival. July 18, 2005. Retrieved April 18, 2015. ^ a b Thompson, Anne (July 22, 2005). "Whedon Flock Ready for 'Firefly' Resurrection". The Hollywood Reporter. ^ "Want To Buy A Ticket To A May 5 Screening Of Serenity!!". Ain't It Cool News. April 27, 2005. Retrieved April 18, 2015. ^ "More Serenity Screenings Announced, Sell Out Immediately". Rotten Tomatoes. May 12, 2005. Retrieved April 18, 2015. ^ Flowers, Phoebe (July 3, 2005). "Amid Rabid Fanship, A Shot At Serenity". Sun-Sentinel. South Florida. Retrieved April 18, 2015. ^ "R. Tam Sessions (Complete)". Archive.org. Retrieved April 11, 2015. ^ a b c "Covert Serenity Promo Afoot?". Sci Fi Wire. Sci-Fi Channel. August 24, 2005. Archived from the original on November 14, 2005. Retrieved April 11, 2015. ^ a b c ""Unofficial" Serenity Viral Videos Emerge". Rotten Tomatoes. September 7, 2005. Retrieved April 11, 2015. ^ a b c d Wilder, Gabriel (October 1, 2005). "Suffering for art". The Sydney Morning Herald. p. 9. ^ a b c Casamassina, Matt; Monfette, Christopher (August 13, 2007). "Serenity Collector's Edition DVD Review". IGN. Retrieved April 11, 2015. ^ Whedon, Joss (director, writer) (August 21, 2007). Serenity—Session 416 (DVD) (Collector's ed.). Universal Studios. ^ "From the Creator of 'Buffy the Vampire Slayer,' 'Angel' and 'Firefly' Comes a Visually Spectacular and Thrilling Action Adventure" (Press Release). Yahoo!. November 8, 2005. Archived from the original on December 9, 2005. Retrieved April 15, 2015. ^ "Serenity (Collector's Edition)". Amazon.com. Retrieved April 15, 2015. ^ "Movie Sales — Box Office Numbers". The Hollywood Reporter. Archived from the original on December 30, 2005. Retrieved April 15, 2015. ^ "Serenity". DVDTalk. December 12, 2005. Retrieved April 15, 2015. ^ Saney, Daniel (December 9, 2005). "Bonus material for UK 'Serenity' fans". Digital Spy. Retrieved April 15, 2015. ^ Gwin, Scott (December 11, 2015). "US Shafted By Serenity DVD". Cinema Blend. Retrieved April 15, 2015. ^ Zyber, Joshua (March 13, 2006). "Serenity — Double Disc Edition (Region 4)". DVDTalk. Retrieved April 15, 2015. ^ "'Serenity' First Universal Title on HD DVD". ICv2. April 10, 2006. Retrieved April 15, 2015. ^ Reimer, Jeremy (January 15, 2007). "First pirated HD DVD movie hits BitTorrent". Ars Technica. Retrieved April 15, 2015. ^ "Serenity: Collector's Edition". DVDTalk. August 19, 2007. Retrieved April 15, 2015. ^ Tyner, Adam (December 24, 2008). "Serenity (Blu-ray)". DVDTalk. Retrieved April 15, 2015. ^ "High Def Digest | Blu-ray and Games News and Reviews in High Definition". ultrahd.highdefdigest.com. Retrieved 2018-05-23. ^ Karger, Dave (September 29, 2005). "Back in Commission". Entertainment Weekly. ^ Gray, Brandon (September 29, 2005). "Box Office Forecast". Box Office Mojo. ^ "Box Office Forecast". Box Office Report. Archived from the original on 2006-12-14. ^ Gray, Brandon (October 17, 2005). "'Fog' Tops Soggy Weekend". Box Office Mojo. ^ "Serenity (2005) – International Box Office". Box Office Mojo. ^ "Serenity (2005)". Rotten Tomatoes. Flixster. Retrieved October 17, 2015. ^ "Serenity (2005)". Metacritic. Retrieved October 17, 2015. ^ Ebert, Roger (September 30, 2005). "Serenity". Chicago Sun-Times. Retrieved September 11, 2012. ^ Hartlaub, Peter (September 30, 2005). "'Serenity' earns director Whedon spot on sci-fi's Mount Rushmore". San Francisco Chronicle. ^ Dargis, Manohla (September 30, 2005). "Scruffy Space Cowboys Fighting Their Failings". The New York Times. ^ Card, Orson Scott (September 30, 2005). "Uncle Orson Reviews Everything". Hatrack.com. Retrieved May 19, 2006. ^ Puig, Claudia (September 29, 2005). "'Serenity' has moments, not much else". USA Today. Retrieved March 31, 2013. ^ Elley, Derek (August 23, 2005). "Serenity Review". Variety. ^ "2006 Hugo Awards". Hugo Awards. Archived from the original on May 7, 2011. Retrieved October 31, 2015. ^ "The Locus Index to SF Awards: 2006 Nebula Awards". Locus. Archived from the original on June 5, 2011. Retrieved October 31, 2015. ^ "Prometheus Awards". Libertarian Futurist Society. Retrieved October 31, 2015. ^ "Films Of The Year". BBC. Archived from the original on July 9, 2006. Retrieved October 31, 2015. ^ Utichi, Joe. "Serenity Special Feature". FilmFocus. Archived from the original on August 28, 2008. Retrieved October 31, 2015. ^ "Serenity named top sci-fi movie". BBC. April 2, 2007. Retrieved October 31, 2015. ^ "IGN.com presents The Best of 2005 - Best Sci-fi". IGN. Archived from the original on December 23, 2005. Retrieved September 12, 2016. ^ "IGN.com presents The Best of 2005 - Best Story". IGN. Archived from the original on December 23, 2005. Retrieved September 12, 2016. ^ "IGN.com presents The Best of 2005 - Best Trailer". IGN. Archived from the original on December 23, 2005. Retrieved October 31, 2015. ^ "IGN.com presents The Best of 2005 - Best Movie". IGN. Archived from the original on December 23, 2005. Retrieved October 31, 2015. ^ "SyfyPortal Awards". October 1, 2006. Archived from the original on November 7, 2006. Retrieved October 31, 2015. ^ "The 500 Greatest Movies of All Time". Empire. Archived from the original on November 19, 2008. Retrieved October 31, 2015. ^ "The 301 Greatest Movies of All Time". Empire. Archived from the original on September 6, 2015. Retrieved October 31, 2015. ^ Yembrick, John (February 20, 2009). "Be Part Of History -- Help NASA Name The Next Space Station Module". NASA. Retrieved March 23, 2009. ^ "Help NASA Name Node 3". March 20, 2009. Retrieved March 23, 2009. ^ "Can't Stop The Serenity". ^ "Can't Stop the Serenity website (The Cause – Equality Now). "Other Worthy Causes: While the majority of profits from a screening go to Equality Now, organizers can choose to donate up to 25% to other charities of their choice." ^ a b Salek, Rebecca (March 2005). "Ghosts! Ghouls! And Joss Whedon?!". Sequential Tart. Retrieved April 15, 2015. ^ "Serenity Comic Bridges Gap". Sci Fi Channel. Archived from the original on May 24, 2005. Retrieved April 15, 2015. ^ "Serenity Comics Due Soon". Sci Fi Wire. Sci Fi Channel. February 20, 2005. Archived from the original on February 20, 2005. Retrieved April 11, 2015. ^ a b "Serenity: Those Left Behind (Hardcover)". Dark Horse Comics. Retrieved April 11, 2015. ^ "Serenity #1 (of 3) (Cassaday Cover)". Dark Horse Comics. Retrieved April 11, 2015. ^ "Serenity #3 (of 3) (Middleton Cover)". Dark Horse Comics. Retrieved April 11, 2015. 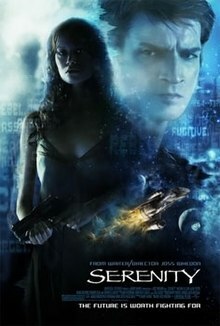 ^ "Serenity: Keith R.A. DeCandido, Joss Whedon: 9781416507550". Amazon.com. Retrieved April 15, 2015. ^ "Serenity — The Official Visual Companion". Titan Publishing. Retrieved April 15, 2015. ^ a b "DST Announces Serenity Screening for Baltimore Retailer Summit!". Diamond Comics. Retrieved April 15, 2015. ^ "Whedon's 'Serenity' Takes Another New Form". Zap2It. April 28, 2005. Archived from the original on May 7, 2005. Retrieved April 15, 2015. ^ "Serenity Role Playing Game". Amazon.com. Retrieved April 15, 2015. ^ "Serenity Premium Trading Cards". Inkworks. Archived from the original on July 15, 2005. Retrieved April 15, 2015. ^ "Inkworks Has License for Joss Whedon Film". ICv2. July 26, 2004. Retrieved April 15, 2015. ^ "2005 Gem Award Winners" (PDF). Diamond Comics. Archived from the original (PDF) on May 10, 2006. ^ "Diamond Select Toys and Collectibles to Produce Action Figures Inspired by Universal Pictures' Serenity". Diamond Select Toys. Archived from the original on March 26, 2005. Retrieved April 15, 2015. ^ "Serenity". Diamond Select Toys. Archived from the original on December 30, 2005. Retrieved April 15, 2005. ^ "DST Finds Serenity with River Triumphant Statue". Diamond Select Toys. Archived from the original on October 8, 2006. ^ ""Inara Strikes" Statue Product Debut". Diamond Select Toys. Archived from the original on May 28, 2007. Retrieved April 15, 2015. ^ "Serenity Zoe's Revenge Product Debut". Diamond Select Toys. Archived from the original on August 5, 2007. Retrieved April 15, 2015. ^ Crawford, Michael (January 6, 2006). "MWC's Picks for Best/Worst of 2005". MCWToys.com. Retrieved April 15, 2015. ^ Whedon, Serenity: Director's Commentary, track 11 "Miranda"
^ a b c Whedon, Serenity: Director's Commentary, track 17 "Fighting for Belief"
^ Whedon, Serenity: Director's Commentary, track 2 "A Better World"; Whedon, Serenity: The Official Visual Companion, p. 21. ^ a b Whedon, Serenity: Director's Commentary, track 10 "Posing a Threat". ^ Frederick Blichert (28 November 2017). Serenity. Columbia University Press. pp. 114–. ISBN 978-0-231-54411-5. ^ Whedon, Serenity: Director's Commentary, Track 14, "Learning the Secret"
^ Terdiman, Daniel (August 3, 2007). "Fans of sci-fi 'Serenity' follow their bliss". News.com. Archived from the original on June 21, 2006. Retrieved June 20, 2006. ^ Murray, Rebecca (December 6, 2004). "Nathan Fillion Talks About "Serenity": On Working with Joss Whedon and "Firefly's" Cancellation". About.com. Retrieved January 30, 2008. ^ IGN FilmForce (December 1, 2005). "Exclusive: A Serenity Sequel?". Retrieved October 30, 2016. ^ "Serenity And Beyond – Exclusive: Whedon on Firefly's future". Empire. January 9, 2006. Retrieved January 30, 2008. ^ "Whedon Responds to sequel rumors @ Whedonesque". Whedonesque.com. Retrieved October 4, 2006. ^ Legel, Laremy (August 3, 2007). "Comic Con: Exclusive Interview with Joss Whedon". ropeofsilicon.com. Archived from the original on September 14, 2007. Retrieved August 3, 2007. ^ Christianson, Emily. "Comic-Con 07's Fantastic Filmmakers: Joss Whedon Goes into 'Sugar Shock'". Hollywood.com. Retrieved August 6, 2007. Blichert, Frederick (2017). Serenity. Columbia University Press. ISBN 978-0231182331. Blichert, Frederick, ed. (2018). Joss Whedon's Big Damn Movie: Essays on Serenity. McFarland. ISBN 978-1-4766-7199-4. DeCandido, Keith R. A. (August 30, 2005). Serenity. ISBN 1-4165-0755-8. Whedon, Joss (September 1, 2005). Serenity: The Visual Companion. ISBN 1-84576-082-4.